In order to support remote observations, we set up an All-Sky camera which continuously monitor the night sky from dusk to dawn. 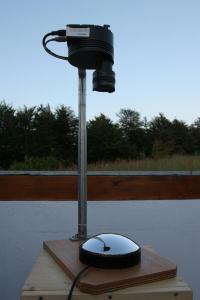 This enable observer to follow the sky conditions on a remote location in real time. As a by-product, the camera records various transient phenomena like meteors, fireballs, auroras, aircraft and satellite passes. Since the camera limiting magnitude on a moonless night is about 5.5, it can also record outbursts of bright Novae. It is in regular operation since August 2004. Our first camera setup (in operation from August 2004 until 25. May 2006) consist of a fast 115mm diameter, f/0.3 concave mirror, giving a 180o field of view from a distance of about 0.5 m. This was replaced with a 150 mm convex mirror with a high quality coating (90%) which enable detection of fainter stars and moving objects. The imaging device is a SBIG ST-7XMEI CCD equipped with a wide-field 2.8/16mm f.l. lens. CCD sensor is KAF-0402XME with 9 micron pixels and microlensing technology yielding a 85% QE at 650nm. Camera setup effective focal length is 2.5 mm. Image resolution is about 15'/pixel. Typical camera exposure time on a moonless night is 60s. It is further automatically reduced according to sky brightness conditions due to twilight and presence of Moon. 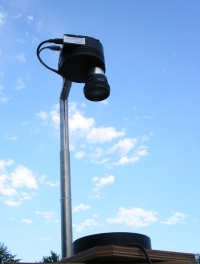 ST-7 CCD camera has a high speed USB interface with 1 second full frame download time. Therefore, only 1-2% of night time is missed due to image download. The imaging system is run in Linux, using Tserver software that we use on other telescopes. Images are bias and dark subtracted immedeately after exposure is taken. They are stored in FITS format and after some time archived on a DVD. A MPEG/AVI movie is automatically composed after each observing session and posted on a public accessible all-sky camera archive . Movies are not of a high quality due to a limited disk space. However, they are good enough to see many interesting phenomena and obtain an impression about the quality of particular night. List of interesting events is posted on a separate page, together with JPEG and original gzipped FITS files. Bright fireball, apparently from Perseid radiant was recorded over the eastern horizon on a 60 second exposure taken on 2004 Aug 16 at 22:12:49UT (center). Please note that all materials are subject to copyright conditions. We are thankful to Edo Smolnikar of the Tehnooptika Smolnikar d.o.o. in Ljubljana for donation of several off the shelf concave mirrors - key components for making All-sky cameras. 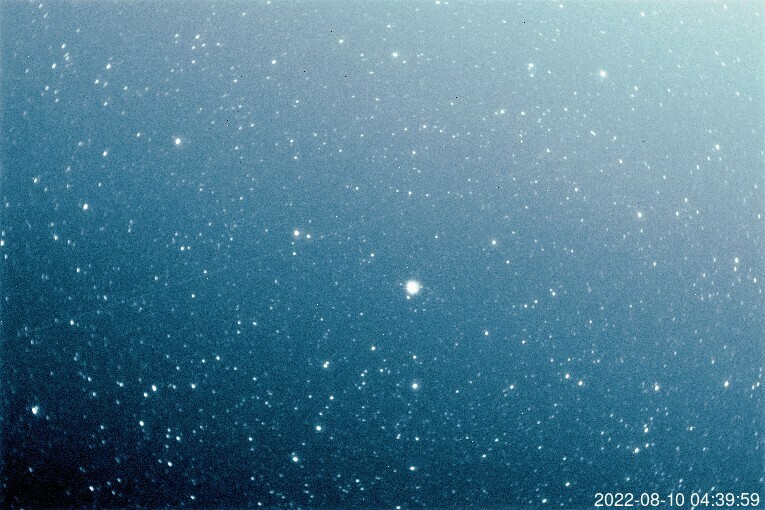 As of December 2005, we upgraded the all-sky camera software by adding a pipeline which continuously perform photometry of star Alpha UMi and the surrounding sky. Each image is analyzed by IRAF Apphot from NOAO package. Sky counts in an area around Polaris as well as light flux from Polaris is extracted, calibrated and displayed on web in real time. These values were calibrated on standard Landolt sequences using 60-cm Cichocki Sky Survey Telescope on the same location. The calibration was set to standard Johnson V CCD photometric filter. 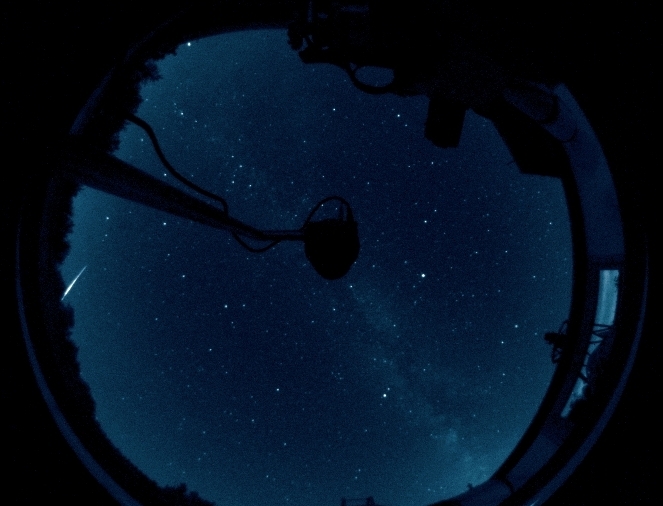 Recent upgrades enable us to have a decent information about the night sky quality which in turn help us to effectively plan and manage the remote observations. Sky brightness and transparency data would be useful also for long term environmental monitoring by providing information on air and light pollution.